Jack Riley, the head of the DEA’s Chicago division, is headed to a top post in Washington D.C., the Associated Press reports. The 56-year-old, who has shed light on the influence of Mexican cartels on the Midwest, has been named the DEA’s chief of operations. The No. 3 post at the agency means Riley will oversee all DEA activity. 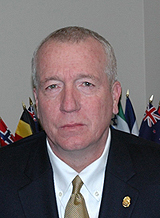 Riley was previously the head of the El Paso office. He is to begin his new job next month. A replacement has not yet been named. Posted: 9/17/14 at 8:44 AM under Milestone, News Story.